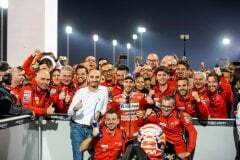 \r\nAndrea Dovizioso seized a spectacular win in the Qatar GP, the opening round of the 2019 MotoGP World Championship, on the Mission Winnow Ducati team\'s Desmosedici. 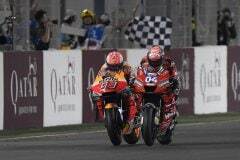 The Italian thus repeated the result achieved last year, once again beating Marc Marquez to the finish line for just 23 thousandths of a second. For Dovizioso, who scored five consecutive podiums at the Losail track, it\'s the 12th win with Ducati. \r\nStarting from first row, Dovizioso led the race from the very beginning, battling with Marquez and Rins, then tried to pull away from the pack in the last few laps. Marquez tried a move at the very last corner but the Italian once again managed to answer back to cross the finish line in first position. Danilo Petrucci also rode a solid race, recovering several positions after suffering a non-optimal start from third row. After climbing back to third, Petrucci faced a small drop and finished the race in sixth, only two seconds behind his teammate. \r\n"I\'m super happy about this win, especially because after the tests I wouldn\'t have expected to be so fast. We stayed focused and we made progress in each session. Our strategy in the race was simply to preserve the tyre, and this made the difference, but it wasn\'t easy because I led for most of the race and I couldn\'t really study my opponents. Marquez gave it everything he could, as usual, and pushed me to the limit. We made the most of our strenghths, that is, acceleration and top speed, but we still need to improve our corner speed. This year there are plenty of quick riders and it\'ll be crucial not to lose too many points on less favorable tracks. We need to keep our feet on the ground and continue working in this direction." \r\n"My sixth place is still positive because we scored important points for the championship. Unfortunately, I was hindered by a less than optimal start, but the race pace wasn\'t very fast and I was able to recover positions quite quickly. Still, I struggled to pass other riders and push hard in braking. In retrospect, choosing the soft tyre for both the front and rear was a gamble, but we expected the temperatures to drop further and we also weren\'t as fast as usual on the straight. That said, the championship has just begun and I\'m confident we\'ll bounce back soon." \r\nClaudio Domenicali, CEO of Ducati Motor Holding S.p.A.
\r\n"It\'s been a very exciting race. Dovizioso was simply brilliant, doubling up on the win scored here last year and keeping the streak open after taking the last round of 2018 in Valencia. This shows how hard the whole team worked during the winter break. The Desmosedici is even more competitive now but we\'ve seen plenty of fast rivals and this was just the first race. We need to stay focused and keep working hard, but for sure we can say Ducati is competitive." \r\n"We couldn\'t have started the season off in a better way. Hats off to Dovizioso, who rode a clever race, without making mistakes, preserving the tyres and managing the situation until the very last corner, where he played his cards wisely. Thanks also to the team, who worked hard all winter to make sure we were ready for Qatar. We\'ll keep putting in the same effort to allow both our riders to be protagonists in the next races." \r\nThe Mission Winnow Ducati team will resume action at the Termas de Rio Hondo track for the Grand Prix of Argentina, scheduled for March 31st.